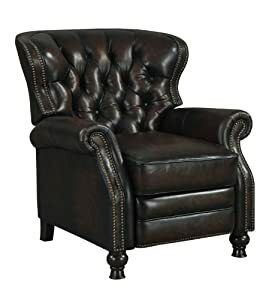 This beautiful 100-percent top grain leather recliner features a double dying process in which some of the second color dye is hand rubbed off to subtly reveal the dye beneath that gives it an 'old world' look and feel, a sophisticated piece of furniture that will add to any room decor. This enduring style with tufted back and accent nail head trim will provide comfort and pride of ownership for years to come. The feather/down wrapped seat cushion with pocketed coils will provide a more comfortable seat and longer life. The back cushions are filled with fiber blown into pocketed channels to prevent settling and preserve the look and feel of your chair. The seat box is made of hardwood for durability. The under carriage of the recliner is covered in a non-woven material to conceal all wood services and give that quality finished look.